By February, cranes on the wintering grounds are becoming more territorial and uneasy around other cranes. Their thoughts are turning to nesting season ahead. Pair formation begins when birds are two to three years old. 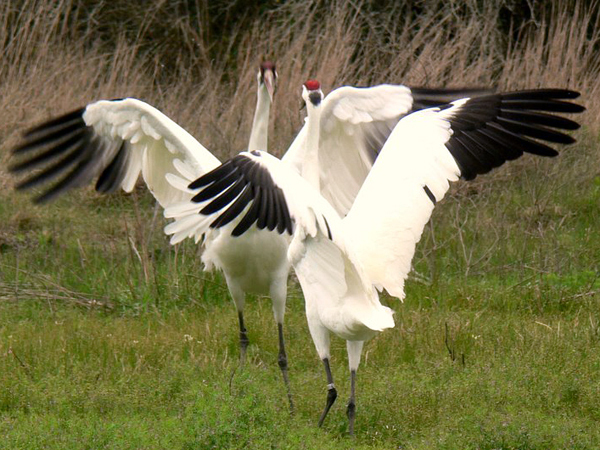 Most cranes make their mate choice only once, so they want to get it right. They dance to attract a healthy, strong mate. The small population makes it urgent to choose a mate that can help raise babies throughout a lifetime. Dancing isn't only for first-time mates. Starting around Valentine's Day, long-established pairs dance to strengthen their bond.